Nichelle Nichols, who played Lt. Uhura on "Star Trek," received an award on Aug. 31 from the organization Shades of Blue for her work as a NASA astronaut recruiter. DENVER — "Beyond and beyond and beyond," sings Nichelle Nichols. The 82-year-old actress-singer's voice sails over draped round tables and wafts through the crowd of black ties and floor-length evening gowns. Nichols' voice hits the back of the hangar housing the Wings Over the Rockies Air & Space Museum. Even the airplanes suspended from the ceiling rafters feel the resonance. "He said, 'Someday, our astronauts are going to go to the moon' and, 'Sing it higher!'" Nichols is working her way up through the octaves again; "Beyond and beyond and beyond." 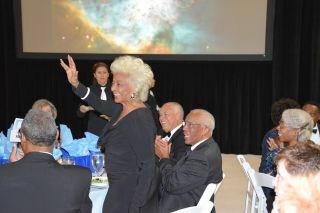 Nichols accepted the Ed Dwight Jr. award here on Aug. 29 at the Shades of Blue Gala — but not for her role on "Star Trek" as Lt. Uhura, fifth in command aboard the Starship USS Enterprise. Neither does the award have anything to do with smooching Captain James T. Kirk (played by William Shatner) in a 1968 "Star Trek" episode, in what is widely cited as one of the first interracial kisses in American television history. "There were 321 (American) astronauts," Shades of Blue president and founder Willie Daniels explains. "Twenty of them were African-American. Because this day in the country we have so many issues around the country causing strife and stress, to be able to look up and have true heroes — that means a lot." Twelve astronauts and a Tuskegee airman are being honored at this event. Actress Nichelle Nichols (black dress, center) and other attendees of the Shades of Blue gala, which was held Aug. 31, 2015, at the Wings Over the Rockies Air & Space Museum in Denver. Daniels, a captain for United Airlines, founded Shades of Blue in 1999 in an attempt to address shortages in the United States' science, technology, engineering and mathematics (STEM) workforce. The organization runs aeronautics summer camps, fly-days and mentorship programs supporting students interested in pursuing aviation and aerospace careers. Shades of Blue currently has 2,000 students under its wing, ranging in age from kindergartners all the way to college kids. The goal is to reach 250,000 students by 2020. "Last year, it was awesome," says seventh-grader Lamir Brewster. "They had tours, showed us planes and their engines." The aspiring pilot's favorite part was "going up in a Cessna." "When I was a kid, astronauts were [in] Flash Gordon comic books," explains Guion Bluford Jr., who grew up in the 1940s and '50s. "As a kid, I thought they'd never select me, so I went into aerospace." Bluford became a colonel in the U.S. Air Force. Then Nichols recruited him for NASA's space shuttle program, and he went on to earn the distinction of being the first African-American in space. Seventh-grader Lamir Brewster, who aspires to be a pilot, attended the Shades of Blue gala on Aug. 31, 2015, at Denver's Wings Over the Rockies Air & Space Museum in Denver. "I'm a direct beneficiary of what they've done," says NASA astronaut Victor Glover, gesturing to former shuttle astronauts Winston Scott, Stephanie Wilson and Joan Higginbotham. "I applied in 2007 for the 2009 class after test-pilot school, recalls Glover. "I was inspired by Pam Melroy, one of the few female shuttle commanders. Watching Pam Melroy speak was the professional 'Wow, this is more than just a childhood fantasy; this is definitely something I want to see as part of my career' moment. "I looked at Winston and at [former shuttle commander and current NASA chief] Charlie Bolden," Glover adds. "I'd read their biographies and saw they were doing similar things. I've been a fan of NASA and of astronauts since I was a kid. I didn't realize how close I was, careerwise. Guys who had gotten there from the military — we had something in common. I have done the lion's share of those things those guys had done to be eligible." Glover applied in 2007 and wasn't accepted. He applied again in 2009 and made it into the newest class of NASA astronaut candidates, which was selected in 2013. That class is composed of four men and four women. "If I put that in front of anyone, they accept it today," Glover explains. "It is exceptional, even though the country is half women. My daughters don't see the exception. They just see that it's right. But it is very special and hopefully will continue. We've got ethnic diversity, gender diversity, and it's an exceptional class." "I was shyer than you when I was your age," Janette Epps assures a young and noticeably star-struck girl. The girl is wearing a pale pink dress covered with black polka dots. She is holding a drawing of Lt. Uhura in her hand. Like Glover, Epps is in the current 2013 class, training to fly Russia's Soyuz spacecraft and live and work aboard the International Space Station. She has a bachelor's degree in physics, studied aerospace in graduate school and worked for the Ford Motor Company before moving on to the CIA. Astronaut Leland Melvin, also in attendance, encouraged her to apply to be an astronaut. Melvin himself was encouraged by Bolden to apply. "Everything is hard until you know it," Epps tells the girl in the polka-dot dress. "This fighter pilot I know, he puked every time [he flew]. He puked every time! If you love it, you do it!"